That is an actual piece of conversation I had with a senior in my university – one of the best educational institutions in Indonesia – a couple of months ago before I did my internship. It saddens me to hear those words. I’ve been studying Civil Engineering for almost 4 years now and even though I kind of lost interest in this field, it’s sad to hear that this field is not suitable for girls. However, I realized that what they were saying is somewhat true. It’s true that working in engineering field is not easy, particularly for women. But why is it true? And does it have to be that way? I believe not. As much as I want to say it is not true that working in the engineering field is not easy for women, it is true. 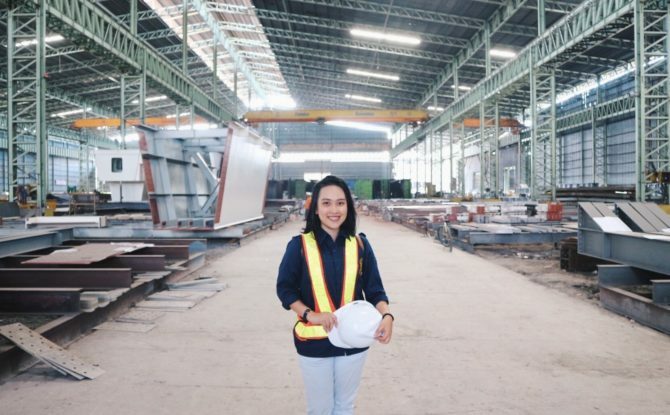 A couple of weeks later, during my one-month internship at a construction site in Jakarta, I experienced unpleasant things. I got cat-called a lot by the workers. I was even photographed by some workers while I was strolling around the site. How inconvenient. Sadly, the not-so-female-friendly workplace is not the only reason. Based on a research conducted by The U.S. Government of Statistics, the possible factors contributing to the small proportion of women working in STEM (Science, Technology, Engineering, and Mathematics) include less family-friendly flexibility in the STEM fields, gender stereotyping, and lack of female leaders in this field. Female leaders, turns out play an important part as well. Female leaders can be the primary advocate of female’s problems in the field along with being role models for other females. Without female leaders, females might lose their bargaining position in advocating the problems – problems that men don’t experience. In addition, it is discouraging to have no role models and to see only a few females able to work and attain leadership position in the field. Thus, it can become a vicious cycle where no female is going to fill the leadership position. Many studies have proved that diversity and inclusivity is good for business, as it fosters more creativity and innovation. It also widens a company’s perspective since they can have multiple points of views from people from different backgrounds. In addition, by doing unbiased employee recruitment, the company will be able to hire the best employee based on their ability. There are a lot of advantages by having more women in the workplace. However, despite efforts have been made by companies, the number of female in STEM field is still low. It got me thinking, perhaps, it’s us females who are not ready to go into the workforce and fight our way to the top. Reflecting back to the condition of females in the university, it might actually be one of the reasons. Gender inequality issue is not really being talked here. I see that my friends didn’t even realize that stereotype threat and gender bias exist. I saw cases where girls somehow chose to stay silent rather than speaking up. I see my girl-friends, despite their ability and experience, choose not to take a leadership role and be the supporting instead. Also, in this men dominated world, we are lacking of a place to develop ourselves as a female, a room to talk about female’s issue, and a way to empower one another. Thus, Femme in STEM was born. Femme in STEM was born in a women’s empowerment spirit as a platform which aims to increase the awareness of females within the world of STEM of the inequality that occurs in the workforce and to nurture and encourage them in order to excel in their respective careers. Envision an equal representation of females and opportunities for females within the STEM workforce, Femme in STEM hopes to break the vicious cycle by generating future female leaders through programs that will help equip female college students with leadership abilities, necessary skills for professional world and guidance on how to solve challenges faced especially by females. Through this writing, I would like to invite you, men and women, to empower girls and women around you to achieve their dreams. So that girls in the next generation can have better chances to become whatever they want to be. So that they won’t have to be afraid because of their dream job is too masculine or too feminine. And so that both girls and boys have equal chances in reaching their dreams without having to be afraid of being judged for their job is not socially suitable for their gender.